EX Networks has a portfolio of connectivity services operating over our resilient MPLS network. Whether you need a simple leased line to connect your office to a Virtual Data Centre instance hosted with EXN, or you require MPLS pseudowires between two data centres, EXN have you covered. EXN operates autonomous system (AS) 35266, a BGP network with multiple 10Gbps and 40Gbps connections. 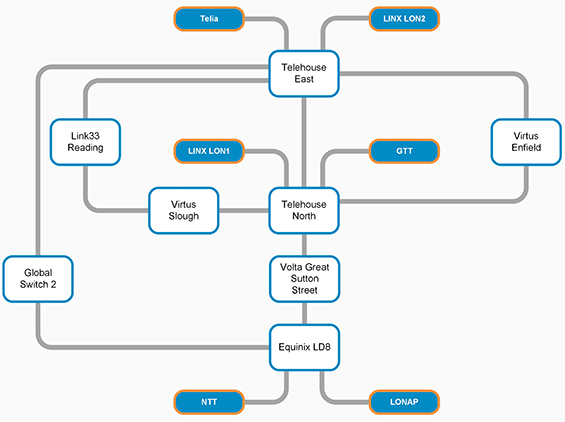 We have carefully selected Tier-I and Tier-II transit providers as well as establishing multiple peering sessions over the London Internet Exchange (LINX) and London Access Point (LONAP) to ensure optimal paths and best possible latency for our customers. The network runs on Cisco ASR9000 routers and a mixture of Cisco Nexus and Metro switches. Each data centre always has at least two discrete devices to ensure customers can have fully redundant connections. EXN also partner with a number of network and fibre providers ensuring our IP services can reach your hardware no matter how remotely they may be located. For more information and pricing on our IP services please contact us. As with all EXN services, customers have fully access to our EXtraNet Portal, a one stop shop for all service related information. You can benefit from real time port statistics and bandwidth graphs as well as all the usual features including our support portal and full visibility of all bills. EX Networks can provide direct connectivity to Microsoft Azure, Office365, Amazon Web Services (AWS) and many other CSPs. Whether you need it delivered to your data centre or office, EXN can provide connections up to 10 Gbps.